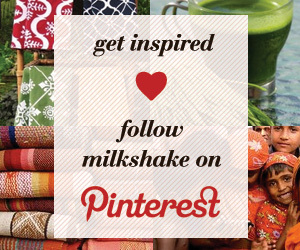 Milkshake | Good Finds That Give Back | Embrace The Age Of Enthusiasm! Every year around this time, people around the world sit down and create the annual list of resolutions. Some people want to get thinner. Some people just want to floss more. Some people have bigger goals—to finish a degree, have a child, buy a house—but all these hopes and dreams have one thing in common. They're about change. The New Year is about change, but this year, we challenge you to do something radically different and instead of making out a list of 20 small things you want to "fix," just do this one thing: become an enthusiast. According to an article from NPR, we are living in an age of enthusiasm. There have never been more opinions more readily available, or more content so accessible. But all this stuff—all these thoughts and products and ideas and things—doesn't always make us happy. Sometimes it makes us critical, sometimes it makes us angry. Instead of letting it pull us under, this year we're going to avoid the negative, recognize it and step aside. Instead of consuming, we'll create. Instead of criticizing, we'll celebrate. We're going to try new things, go new places, learn a new language. We're going to be as thirsty and brave as we can be, and we hope you will, too. Don't just lose 20 pounds this year. Gain a new outlook. Let yourself be enthusiastic, even embarrassingly so. In the often-quoted (yet always relevant) words of Gandhi: "be the change you wish to see in the world."